Alright guys, a years worth of building, learning, and experimenting has led me up to this point. It's time to order and build a proper Tricopter to use for FPV and Aerial Photo/Video. I'm a complete novice when it comes to using the eCalc, so the components I have chosen have all been based on other peoples reviews and experiences. As with all of my builds, one thing they all share in common is the word budget. This one will be no different, I'm out to get the most bang for my buck. One mistake that I have made in the past, when spec'ing new parts for a build, is that I would start with an AUW I wanted to lift, and then build up to that number. As an example, on the last quadcopter I built, I just wanted it to carry a Canon Powershot camera and pretty much do nothing else. I don't remember the exact numbers but, just as an example, I came to the conclusion that my AUW would be around 1kg, so the components I chose would generate about 2kg of thrust; 2:1, good to go. The thing I didn't take into account was the uncontrollable urge to grow, and want to do more. After switching to a better FC board; adding Bluetooth; GPS; LED lighting (you know, for those night flights); a better paint job; 1 axis gimbal; and lastly, a few globs of epoxy for "good" measure, it could no longer lift the camera. This time around, I want to make sure there's some wiggle room. Getting involved with FPV is something that I've really been looking forward to. While I've spent hours, if not days, reading up on the subject, I have no hands on experience or really "know" what I'm getting in to. So, when it comes to weight, and how much I should account for, I have no ideal. What kind of setups are you guys running and how much do they weigh? 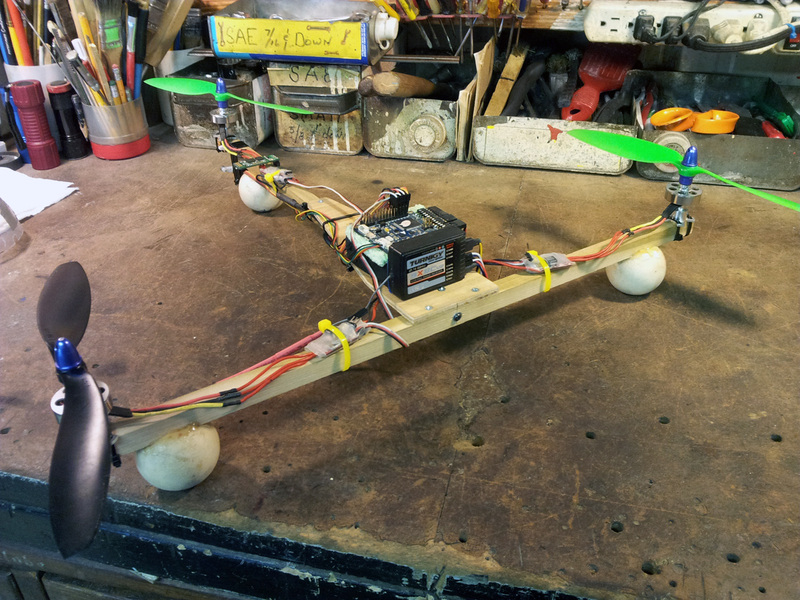 I was originally thinking about putting together a tricopter based off of David's v2.5 design using the DT750 motors. With it, I know I could at least carry a GoPro and FPV system but what if I, like previously before, wanted to grow and do more? Would I be repeating my previous mistake of just building up to a desired AUW rather than buying a pair of shoes a couple of sizes bigger so that I can grow in to them? Total cost, without shipping is $92.76, which isn't bad. 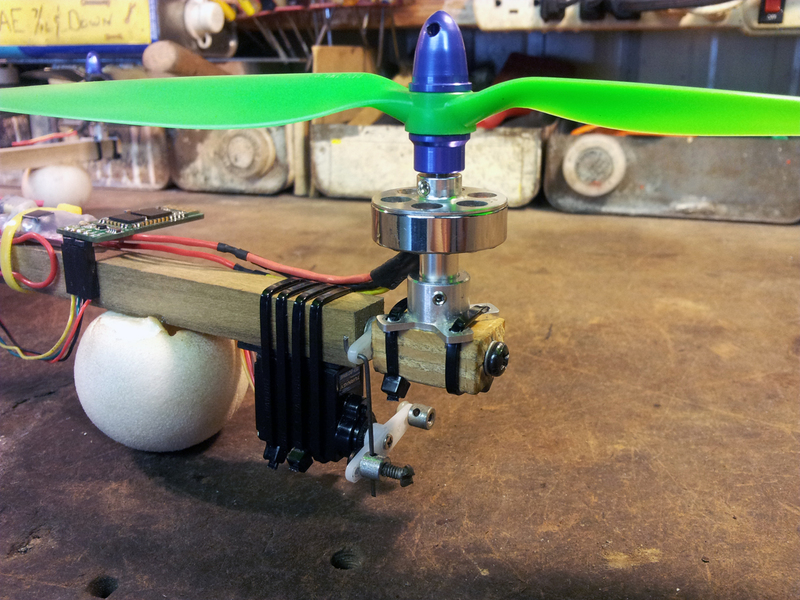 Ideally, I'd like to spend no more than $120-150 on the motors and ESCs. From what little I do know about eCalc, it appears that I should be able to build a decently sized/powered tri around this setup. I've also read that they can handle a 4s LiPo just so long as you're cautious of prop size. To bring this long, possibly boring, forum post to an end, what do you guys think? If you were wanting to build something a little bit larger than David's v2.5 tri, and were on a tight budget, would you go with this setup? A couple of other things I meant to ask: Can anyone suggest a good servo to get and what size (capacity) LiPo pack should I go for? If I may ask, why do you want a bigger Tricopter? Try to gather around all your things that you want on your Tricopter and collect as much weight information as possible and from that decide what kind of setup you need. A simple rule is if you gain weight you have to increase thrust and more weight equals less flight time. And for 150usd that makes that a bit limited. 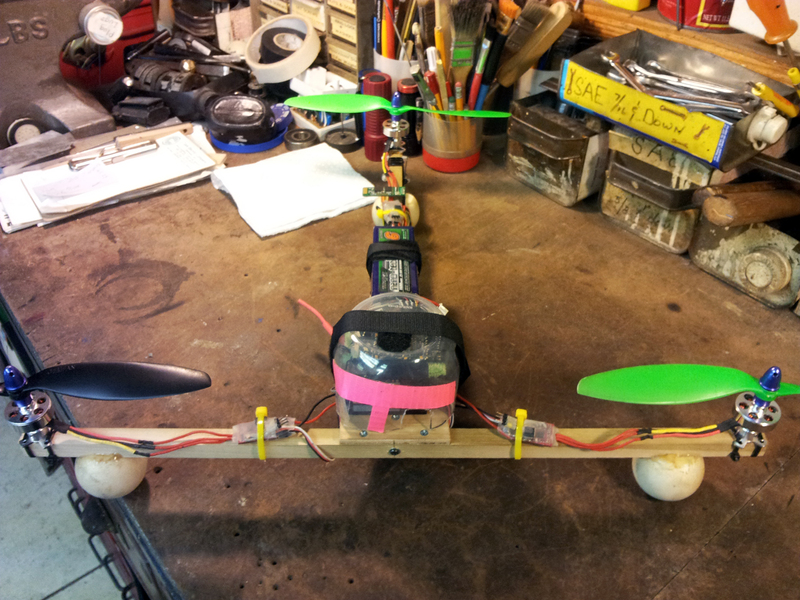 On my Tricopter I use 1000kv motors with 10x4,5" props. 30A ESC and 12g digital servo for the yaw. And I get about 8-12 minutes fully equipped with gopro including case and 2200mAh battery. I see a lot of hand-wringing over how much some design will lift. People spend an inordinate amount of time calculating, sizing and fretting over what they want to lift and if it's possible. For the most part, if you put decent mid-range motors. . . like those Hextronik DT750s on a quad or tri, use sensible props >10" <12.5", a decent size ESC, 18 or up . . .you're not going to have any trouble lifting most stuff, IF you're halfway reasonable. What might happen if you start getting crazy with add-ons is you have to keep the throttle uncomfortably high, (70%) and the ESCs and battery get warm just maintaining a hover. And of course, you find you have a sluggish craft that has very little wiggle room for evasive maneuvers such as flying over trees and you get caught in your own thrust column, or you descend a bit too fast have have little power to recover before plopping down hard on some asphalt or concrete. I have rather large and gangly steam-punkish 685mm wood quad with the DT750s and HK20A ESCs using a standard 3S 2200 25-50c and weighting in at 1,600g and find there's plenty of power. I imagine I could go right on up to around 2000g before I started having issues. Thanks guys for the input. The application I'll mainly be using it for is AP and video. I had been sold on the v2.5 setup for awhile now, I just fear that with a 900Mhz 800mw FPV system (I'm surrounded by trees) and the possibility of maybe adding on a gimbal in the future, I'll be pushing the lifting capacity of the v2.5. Or, I might not be, I don't know. I'd like to be able to input the DT700 DT750 motors into eCalc but they're not listed nor do I know the specs of the motor. Does anyone have this information? I came up with a rough estimate for the payload I'll be lifting, and speaking just the electronics (Camera, FPV, FC, GPS, BT) I'm looking at about 500-600grams. An estimate for the DT750 motors w/ ESCs (someone with this setup please correct me if I'm wrong) is around 500grams. Add on another 200grams for a 2200 LiPo and I'm looking at about 1300g. These are all just ballpark numbers but I imagine my end AUW will be around 2kg. So, if I can build something capable of that, I think I'll be good to go. As Cyberdactyl hit on, I have been doing a lot of hand-wringing over this build. Even though this will be the 6th multi-rotor that I have built, it'll only be the second time that I have had the luxury of being able to pick and choose the components that I really want, as opposed to just building with what was on-hand. Because of this, in the end, I just might end up going with the 2.5 design w/ DT750s. Main reason being, I know it's a proven design where as with my previous chosen setup, it'll all be uncharted waters. Worse case scenario, if the 2.5 tri doesn't end being what I need, I can also turn around and sell it. Either way I end up going, I'll be sure to post my progress in a build blog. If I may add to my previous answer, I have tested quite a few tricopters and the best one was a tricopter based on the 2,5 but the body is 20%bigger and i used 12mm booms instead of 10mm. This made it a little bit more stable and the weight is about the same. If you want I will post some photos to show you. Hey SirToby, that would be great, I'd like to see how you have it setup. How did you setup your yaw mechanism, did you go the direct drive method? Well, I finally pulled the trigger and ordered everything the other day. Two of the items I wanted are on back order though (DT750s and Minim OSD) so no telling when they're going to arrive. I did split up the order so I could go ahead and get the other parts in and should have more than enough to get things started. I'm kind of torn on the frame design though, given its application (FPV/AP) i don't know if I should go with a T-copter layout, that I absolutely love, or if I'd be better off building a traditional tri. Like yourself, I'll also be using 12mm wood dowels for the build. I just recently built a new frame for my "beater" tri and used 10mm wood I had laying around. Not sure what kind of wood it was (I thought it was pine), but it wasn't very sturdy at all and, as a result, I had to do a lot of work on the tail boom to stiffen it up. I have since rebuilt the frame (busted the 10mm one while trying to flip) out of newly bought 12mm pine and wow, it's very ridged. 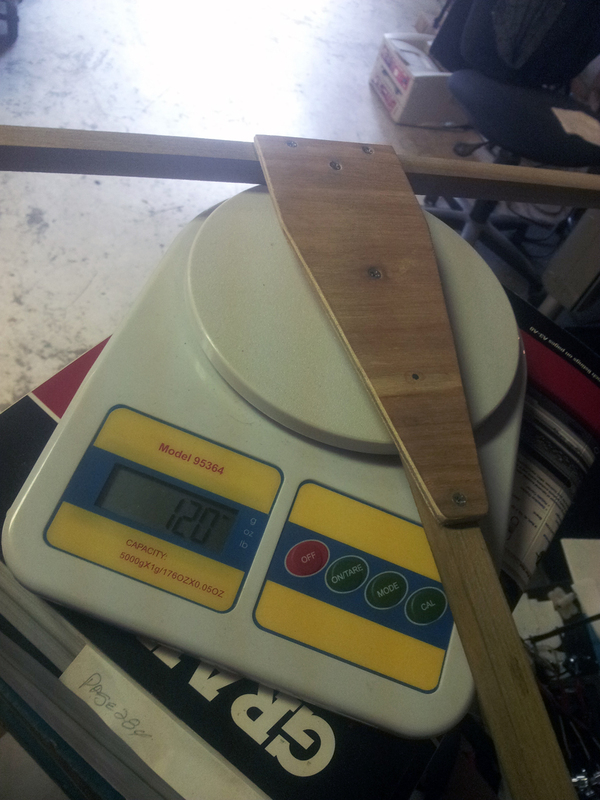 After using thicker wood, and making it a bit longer, from 400mm-450mm, it was only 20g heavier. Here are some pictures of the new frame.